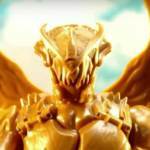 Tokunation › Power Rangers Movie › Power Rangers 2017 Movie Goldar Revealed! Power Rangers 2017 Movie Goldar Revealed! A new toy commercial for the Power Rangers 2017 Movie has given us our first look at the films’ second villain! The iconic Mighty Morphin era monster known as Goldar is reborn in an exciting new style! 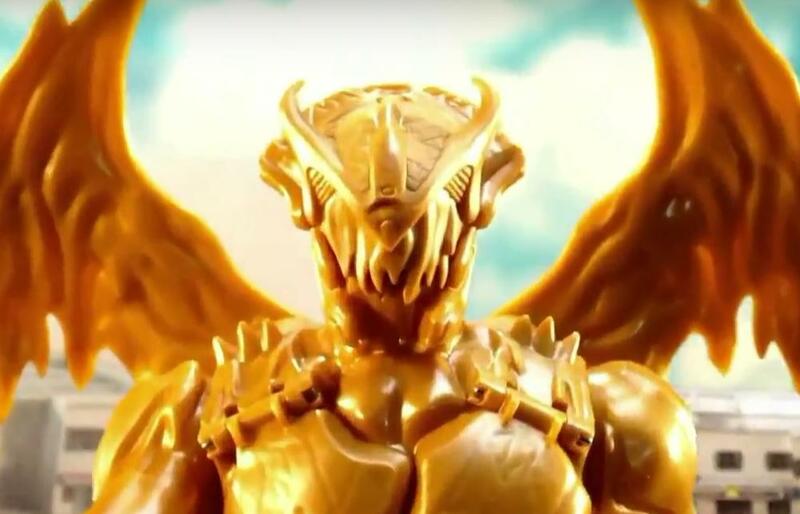 The massive golden winged creature shown here is Rita Repulsa’s most powerful General, almost certainly a worthy opponent for the new team of Rangers and their Megazord. Early script details for the film suggest Rita brings this creature to life by stealing large quantities of gold. While the visual design definitely seems to support that rumor, no official story for Goldar has been released at time of writing. Goldar will face off against the new team of Power Rangers in theaters on March 24, 2017! Stay tuned to TokuNation as we keep you up to date on all Power Rangers Movie news! I hear the melting wax look is all the rage this year. I find myself unsurprised at another awful design from this film. Regardless of whether it's Goldar or not, it just seems lazy and uninspired. 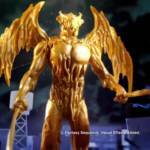 I wonder what goes inside Goldar's chest. Maybe Rita? It's literally just a melt-y gold monster...which is fine. If it wasn't supposed to be Goldar. Conceptually I don't hate this. I mean the toy looks terrible but then so does the Megazord so I'll hold out judging that too harshly for now. Kinda looks like a gold Megazord. I wish he still had a feline face to add some life to it. It looks like a failed attempt at trying to make a replica of the 2017 movie Megazord with peanut butter ice cream. Yeah they're really trying to push the idea that Rita was a former Ranger gone rouge. Which I think has won me over somewhat recently despite some of the disappointments this film has shown. Those kind of changes I can accept for sure. 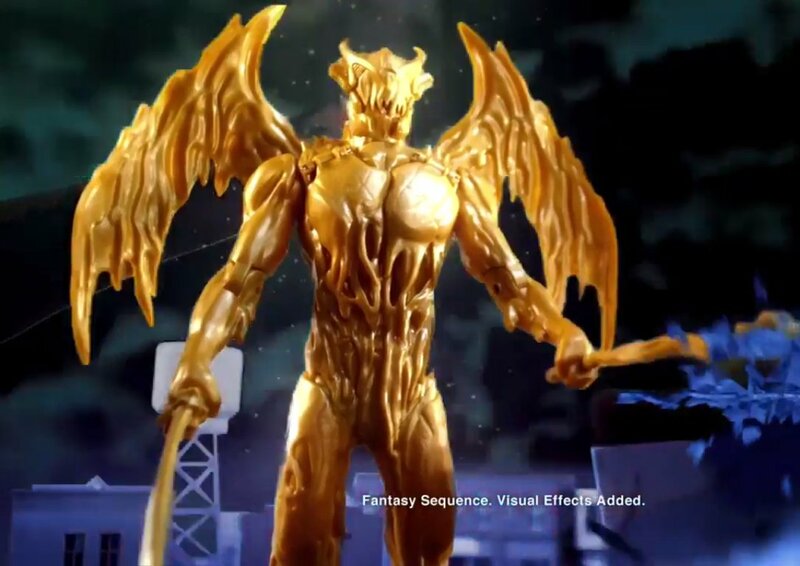 And I still strongly believe they want to pimp out some ice cream franchise with Goldar. Gonna patiently wait for that limited edition ice cream. But in all seriousness I do like that bit about her past. See, the Rita being a defected ranger thing can support Goldar's design here IF HE'S NOT DESTROYED. Cause like if the point of Goldar is supposed to be Rita's version of a Megazord, then in that case I'd say its an interesting change. That said, having not seen the film and knowing how most of these movies tend to go, I'm not holding my breath over Goldar surviving into a sequel unless it's something they establish can be re-created. Granted, the problem there is that it essentially turns Goldar into a shell with no personality. In the end, this is all speculation and theory-crafting, though.